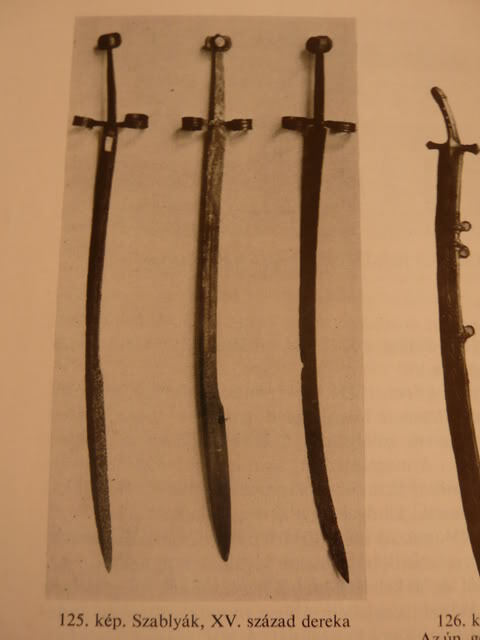 I am looking for all possible data/measurements concerning hand and half sabres located in Budapest National Museum (will welcome any other examples as well). There have been several threads around various arms forums, but none got really developed. I am wondering if there are really so few examples or it is just the matter of lack of access to research materials. It's a very interesting type and I will like to know what you find out. "The other vital stats are as follows: Oa. length: 107 cm, blade length: 85 cm, width of the blade: 3,6 cm next to hilt & 4,4 cm where the false-edge flares out. The width of the guard is 17,2 cm. Near the hilt the blade is 6,5 mm thick and tapers rather neatly towards the tip. The point of balance is 13 cm from the guard and pivot point and forward vibration node overlap few centimeters before the false edge begins. " That is from his reproduction. Maybe he measured an original type? The left one: total lenght: 109 cm, width of the blade: 4 cm, weight: 1 kg. Middle one: total lenght: 106 cm, wob: 3,6 cm, weight: 1,35 kg. Roght one: total lenght: 108 cm, wob: 4,1 cm, weight: 1,05 kg. Great thanks Henrik! Do you happen to have some better quality pics of these?